The Rowlands – Patsy, left, Keith and Mitch – recently took over operation of the Winthrop Store, where Mitch will preside over Guido’s Deli. Yes, there is a Guido at Guido’s Deli, the new eatery at what has been known for the past few years as the Winthrop Store. 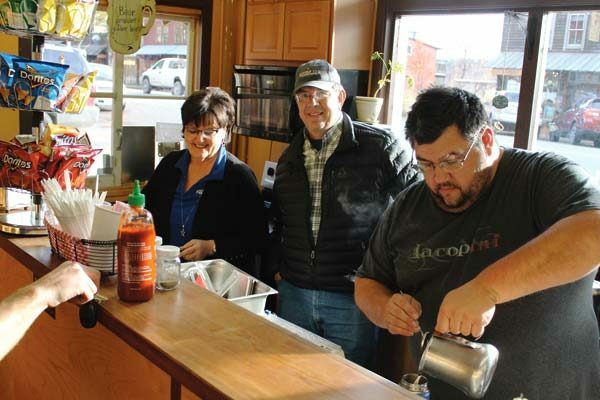 But folks who have lived here a while might recognize the guy behind the counter as Mitch Rowland, a Methow Valley native who has returned to take over the food service at the combination cafe/espresso bar/gas station/retail store on Riverside Avenue. Mitch’s parents, Keith and Patsy Rowland, recently purchased the store from Tom and Lucinda Bowers (it is not associated with the Winthrop Motors garage next door). The Rowlands are owners of Winthrop Star Properties, a few steps away next to the Chewuch River bridge. Mitch said people have asked him about starting a restaurant in the valley, but he didn’t want to get into that business. When his parents learned the Bowers were selling the store on terms, they used proceeds from the sale of other assets to buy the property. That created an opportunity for Mitch to put his culinary skills and experience to work. “We saw a good investment that Mitch could do well with,” Patsy said. Mitch, born and raised in the valley, graduated from Liberty Bell High School in 2000. He attended the Inland Northwest Culinary Academy in Spokane, where after a two-year program he was accredited as an executive sous chef. He has subsequently worked at a variety of restaurants, as well as operating Guido’s Gourmet, a personal chef service. Mitch picked up the Guido persona when he was in culinary school and there were two Mitches. Because of his Italian heritage (from his mother), people started calling him Guido, Mitch said. While the basics at the Winthrop Store will remain in place, shoppers will find differences in the deli menu, some of the retail offerings, and in the wine and beer cases. In addition to cooking, Mitch’s special interests include espresso, craft beer, good wines and automobiles — knowledge that will come in handy at the store. Patsy will handle the banking and have a part in stocking the gift lines. “There will be more unique Methow Valley things,” she said. Patsy said they are planning a more aggressive social media presence for the store. Keith added that the store will cater to local folks as well as visitors. Response in the few weeks since the Rowlands bought the store has been supportive, they said. The Rowlands expect to add employees as needed at the store. The Rowlands have been in the valley for 37 years, which seems local enough. They moved their real estate business to the downtown location from Highway 20 a couple of years ago. Keith is on the board of the Winthrop Auditorium Association, and Patsy is on the board of The Merc Playhouse. 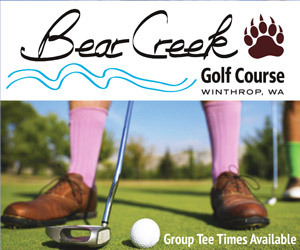 “We are committed to the town … we love our community,” Keith said. The store will open at around 7 a.m. and offer an early bird special — Blue Star coffee and a breakfast sandwich for $4. “If the gas pump lights are on, we’re open,” Mitch said. The Winthrop Store is at 228 Riverside Ave. The phone number is 996-2175. 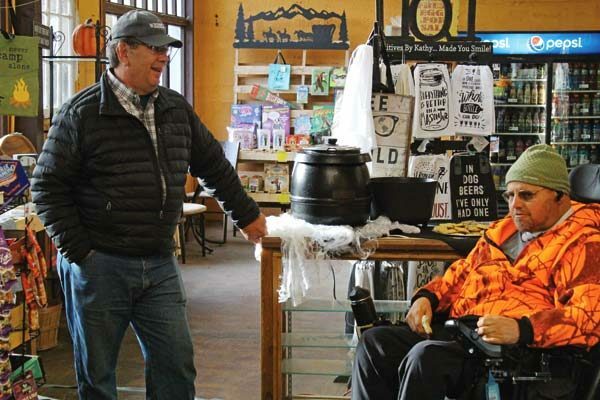 Andy Johnson (right), who knows something about coffee from his days at Java Man Espresso, visited the Winthrop Store last week to check things out.